Boot up multiple client-side computers within LAN over the network boot from ISO image file on a server-side computer for system maintenance and optimization. What is PXE boot? It is booting multiple client computers within same LAN from an image file on a server computer through the network boot for system maintenance and optimization. It’s easy to use. After installation, you just need a few clicks following the PXE boot process. Besides, it supports synchronous boot of multiple computers. When to Use AOMEI PXE Boot Tool? Many computers need maintain/update/install OS but plaguy to insert CD/USB in them one by one. Lots of clients within LAN need install system but they have no CD-ROM drive/USB ports. Multiple bare metals need install system but their CD-ROM drive & USB ports are unavailable. Many clients need of system installation but no CD/USB image to boot them up. Computer can’t start and can’t boot through image on inner disk. 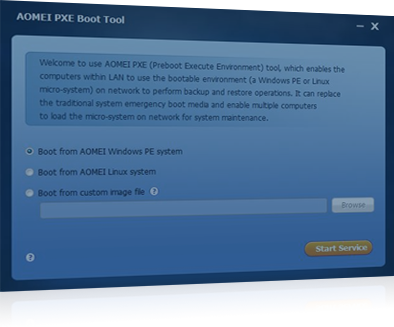 Compared with other PXE boot software, AOMEI PXE Boot Tool supports bootable micro-system created by you. Therefore, if you have a powerful Linux bootable ISO or Windows PE bootable ISO, you can easily maintain the computers within LAN through network boot with your micro-system. AOMEI PXE Boot provides 30-Day free trial for personal and system managers, aiming to provides with a faster and easier way in building PXE boot servers. 1. Install AOMEI PXE Boot to a master computer, select an image file and start service. 2. Set client computer BIOS boot mode as "Network boot". AOMEI Backupper is a powerful backup and restore software; it's also a necessity for system maintenance. Yet, AOMEI PXE Boot is a tool deriving from AOMEI Backupper. Therefore, you can make use of this PXE tool through downloading the free edition of AOMEI Backupper.